I write this from the passenger seat of our car as we head back to Boston. It’s the first time since the fire that I’ve had a few minutes to really sit, think, and reflect on all that’s happened. As I stare at the other side of I-90, my mind can’t help but travel back to last Monday and recall how different our emotions were when were flying in the opposite direction. Last Monday started out as a normal day. I went to work, came home, poured myself a delicious Tasteful Deception while I made dinner. We were just finishing eating when my friend from back home texted me. Through sobs, she let me know that everyone was safe but even still, I’m not sure I’ve ever heard her more upset. He quickly replied, “I want to come with you”. We were packed and in the car 15 minutes later. The next 3 hours seemed to crawl by. We spoke to one another occasionally, but mostly sat in quietly with our thoughts – too shocked and saddened to articulate anything in depth… and maybe hoping that not mentioning our fears out loud would somehow stop them from becoming true. I checked my phone periodically as the online footage of the brewery burning continued, tortured by the fact that all I could do was watch painfully through a screen, still miles away. As I sat there then and as I sit here now, it’s impossible still for me to not feel incredibly saddened by what was lost in that fire. My mind flashes back to the early days… when my parents and brother first purchased the old building that would eventually be transformed into Common Roots Brewing Company. My heart sinks as I think about all the effort my dad, brother and so many of our friends and family members put into renovating the space. I remember whenever we were in town, which was more frequently in those days, they’d always find us a project to work on. There was always so much to do then, and we were eager (and still are) to be a part of it. My brother’s excitement, even in periods of exhaustion (which was also frequent then), is contagious. These memories are the ones I need to keep pushing back down for the time being. For now, they still hurt just a little too much. True, it was just a building and its contents that burned…but overtime our brewery had become almost a member of the Weber family. It was like our youngest sister that we all collectively wanted nurture and see grow and develop. I’d brag to my friends about her, show off pictures, and tell stories about how she was growing. So, when I finally arrived at the site on Monday night, I knew it was going to be hard. And it was. Because we were arriving so late, most of the crowds had already cleared. Christian and my father were standing out front aside one of the few remaining firetrucks, staring at the still-smoking devastation from the street. My dad saw us first and greeted me how he usually does, “Kay-Webs!” and put his arms out for a hug. “Dad…” was all I got out before I started crying. It was. But as days went by, we processed that sadness together and breathed through our relief that no one was hurt, and that the situation wasn’t much worse. For example, I was incredibly fortunate to be able to stay in the area with my family all week and bear witness to the outpour of support from the community. Within hours of the tragedy, friends and former employees were already rallying to organize benefit events and fundraisers. Countless people and organizations have reached out to see how they can help and offer kind words of support and encouragement. It’s been unbelievable. To say we are touched would be an understatement. We are grateful, humbled, and truly in awe of the kindness and generosity of the greater community. It is clear to me through all of this that the “Common Roots Family” has grown to be much, much bigger than the Weber family alone. That family is strong and will keep pushing forward. There are many tough months ahead, but I’m excited to return home on weekends in the future and see the progress that takes place at Common Roots. And while they may not be doing the actual construction this time, I expect my dad and brother will once again lead me around the brewery and point out new developments they’re proud of. Eventually, they will again find that contagious excitement that fueled us all in the very beginning. I’m excited for that time and am prouder than ever to be a part of this Common Roots family. Click here to support the Common Roots Recovery GoFundMe. Some rides are not meant to be raced. Your first 100 miler is probably one of them. At least that was my takeaway from this weekend. I rode the Sea Gull Century ride in Salisbury, Maryland and had the most fun checking off my first 100 miler on the bike. Going into the ride, I was in decent cycling shape coming off training for a 70.3 in September. Still, making the jump from 60 mile long-rides to the full century was intimidating, even on a flat course. I had never fueled for a ride that long and it was more hours than I’d ever put in the saddle. In my over-anxious mind… there was much to go wrong! The family – most of us rocking our Common Roots Brewing Company jerseys. Turns out, I need not have worried. The day was perfect. 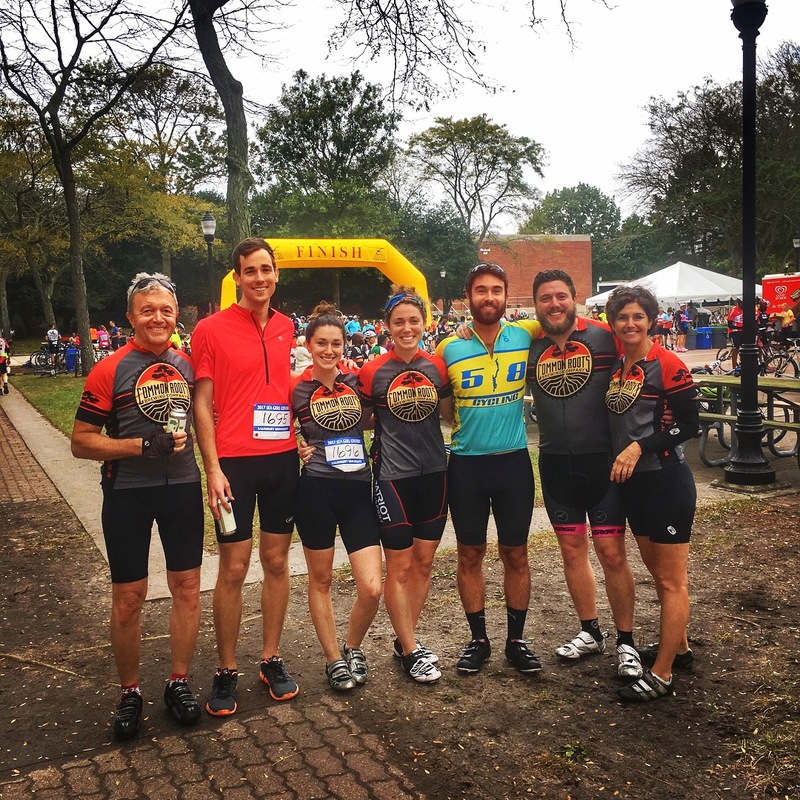 I rode with my entire family and, despite coming into the ride with different levels of fitness, the group of us decided to stick together and ride socially. We built our own pace line and slowed down anytime someone came close to falling off. In addition to spending a lovely day together as a family, this was also great pacing mechanism, forcing me to quell my [overly] competitive nature, focus on fueling and hydrating correctly, and truly just enjoy the day. 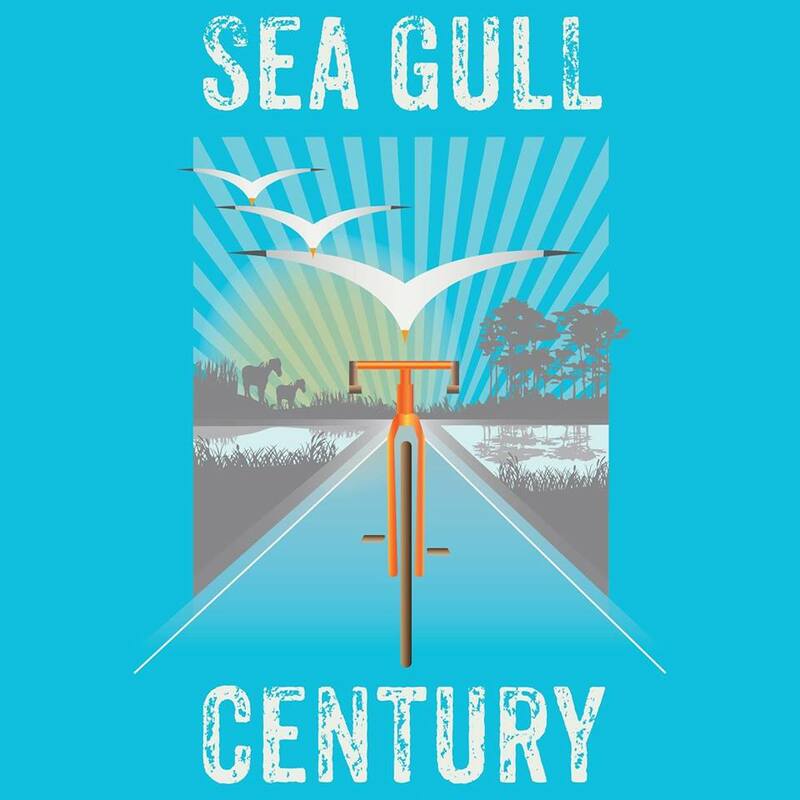 As an event, the Sea Gull Century is a perfect course to ride for pure fun. 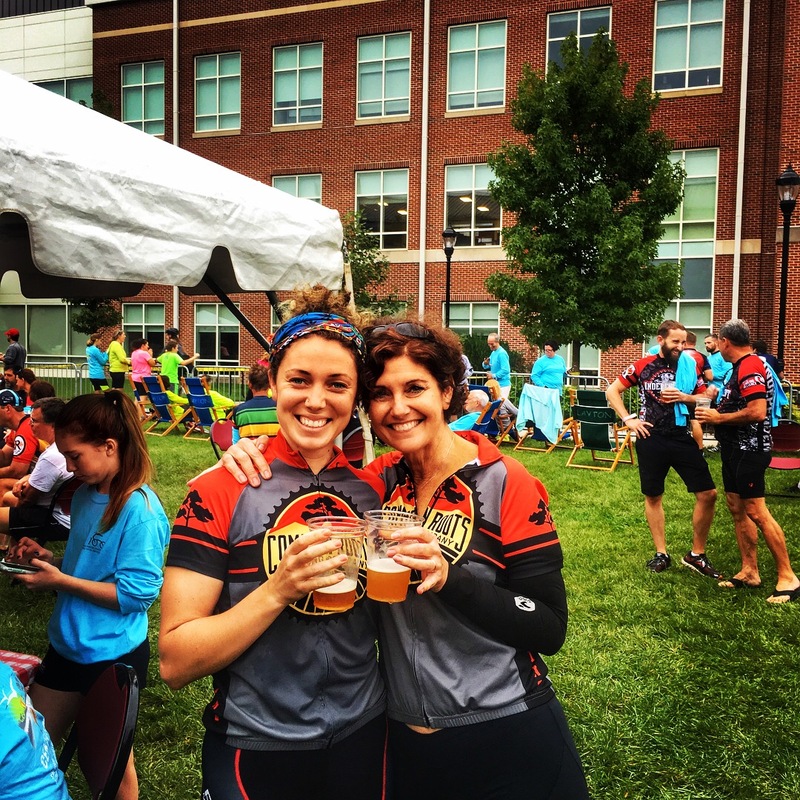 Over 5,000 cyclists turn out for this fundraiser for Salisbury University. It is well-organized and supported by volunteers and draws cyclist from all different abilities. In addition to the 100 mile course, there is also 62 mile “metric century”. There are rest stations every ~20-25 miles (even one that serves beer 10 miles before the finish), the terrain is incredibly flat, and the 99% of the roads are in perfect conditions. We only stopped at two out of the five rest stations but did spend a solid 20-25 minutes at each one, using the restrooms, fueling up, filling our water bottles and stretching a bit. I did find that starting up again after stopping was one of the toughest parts of the day so will keep that mind in the future… and maybe be a little quicker at the rest stops. Pacing – riding several mph slower than I would have normally allowed me to finish the ride with some gas in the tank… i.e. great practice for Ironman when I’ll be starting a marathon (versus cracking a beer) off the bike. My legs felt fantastic (almost fresh even!) on my 5-mile recovery run the next day, which gave me some confidence about my fitness base going into the “off season”. Fueling and Hydration – I ate some sort of solid carb every 20 miles or so (I like having something solid in my stomach) and kept my water bottles filled at the rest stations. I ran out of Infinit powder but filled up one bottle of water and the other with Gatorade and that seemed to work okay. The shots of pickle juice at mile 65 on Assateague Island were a game changer… I felt awesome afterwards. Note: Had it been a hotter day, my casual approach to fueling may not have worked so well (I have a pretty high sweat rate). Planning to get more precise and dial in nutrition in prepping for IMLP. Equipment – I hadn’t spent much time on my road bike since starting triathlon race season so decided to give it some love with a proper tune up before the race. Shout out to Mystic Cycle Centre – my old roadie rode great! My one blunder was forgetting to transfer my tube repair kit from my tri bike to my road bike, meaning I nothing to change a flat with. Luckily, we had just one flat in our group (and it wasn’t me), so we were covered in terms of tubes and CO2… still not a great move. After being carried 100 miles, this tasted delicious. 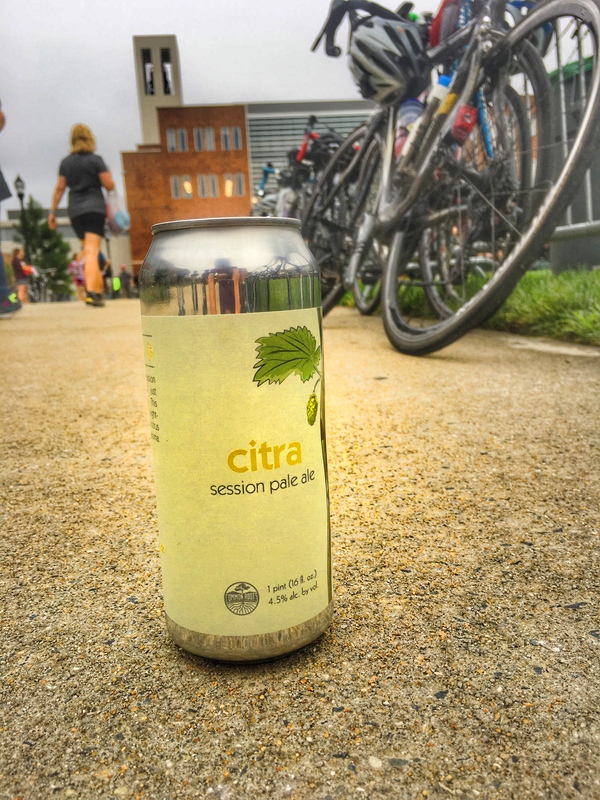 Fun – I had fun from start to finish of this ride – took in the scenery, caught up with the family, and visualized cracking open the 16 oz can of Citra Session Pale Ale we each carried in our jersey pocket the full 100 miles. Slightly warm and shook up… It was as delicious as I imagined it being. Summary: The Seagull Century was a fantastic experience. We will be back again next year to do it all again. With my first 100 miler under my belt, signing up for the next one won’t be so intimidating. Any good race (or ride) suggestions? Currently accepting recommendations for my next century! Me and Mom celebrating the way we do after the ride.